NEW YORK—Musician Jules Levine was taking notes through Shen Yun Symphony Orchestra’s performance Saturday evening at Carnegie Hall. “The musicians are wonderful, and the singers were great. I just enjoyed it altogether,” Mr. Levine said. 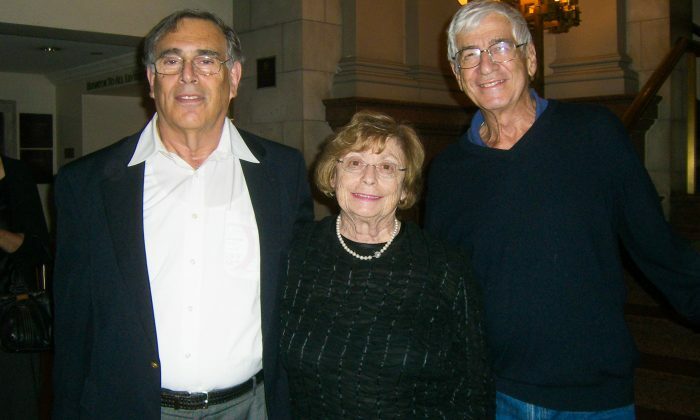 Mr. Levine attended the performance with his friends Mr. Martin Hecht and Ms. Margo Hecht. As a musician with training in Classical and Russian music, Mr. Levine noticed the unique use of scale in Shen Yun Symphony Orchestra. Shen Yun Symphony Orchestra blends traditional Chinese instruments into a classical western symphony—something no other orchestra has succeeded in. Instruments like the Chinese pipa and dizi play alongside flutes and violins harmoniously. “I enjoyed the performance. I think the cross-cultural music is wonderful,” Mr. Levine said. “Its all-original music draws upon China’s 5,000 years of civilization—with its array of dynasties and peoples from which to find inspiration—breathing new life into themes and musical styles from ancient times,” the orchestra’s website explains. Shen Yun Symphony Orchestra’s performance was met with encore after encore, which Mr. Levine said he enjoyed. “The [last] encore piece was very exciting, was very fast, had a lot of good musicality,” Mr. Levine said.